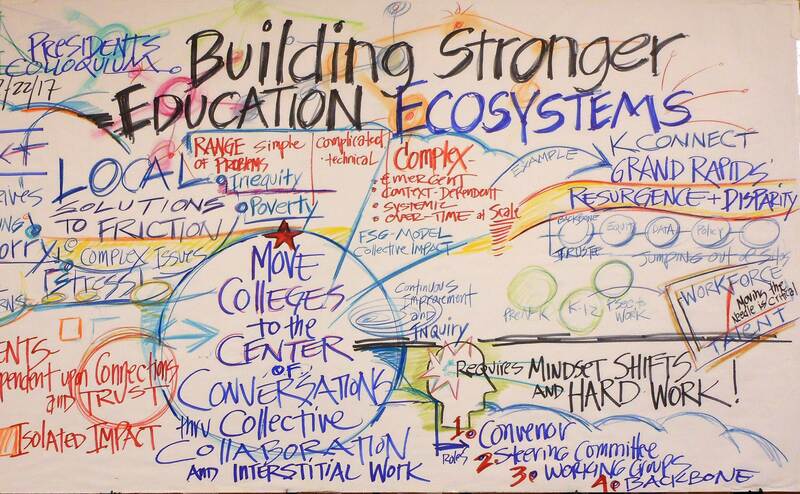 Ken Hubbell is a practiced graphic recorder and facilitator bringing together powerful visuals and discerning storytelling to enrich strategic dialogue and planning. He calls this integration The Art of Change. By capturing on wall-sized murals the essence of a strategic thinking or planning retreat, Hubbell draws out the most powerful and lasting insights into compelling Storyboards, Strategy Guides, Action Maps or Business Model Frameworks. The sheer size, clarity, and imaginative visual metaphors help leaders maintain strategic focus and commitment while they are immersed in real-time change-making. These storyboards become the building blocks for communicating strategic vision, key challenges and collective direction; they pave the way for effective action and graphic dashboards. 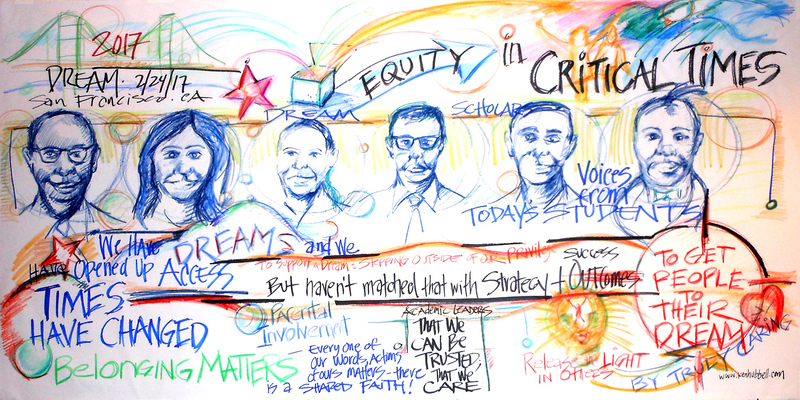 Often, we embed quick portrait sketches of key participants, and panelists to connect people with their ideas and to reflect the human diversity at the center of important change processes. We also incorporate visual thinking technologies in many of our strategic facilitations to engage participants in design thinking and system mapping processes that produce breakthrough ideas. Working in real time with leaders we produce strategic graphics to convey the central concepts, challenges, or priorities. We collected a sampling of our visual storyboards in the Gallery of Change Mapping Graphics (see icon to download a copy). 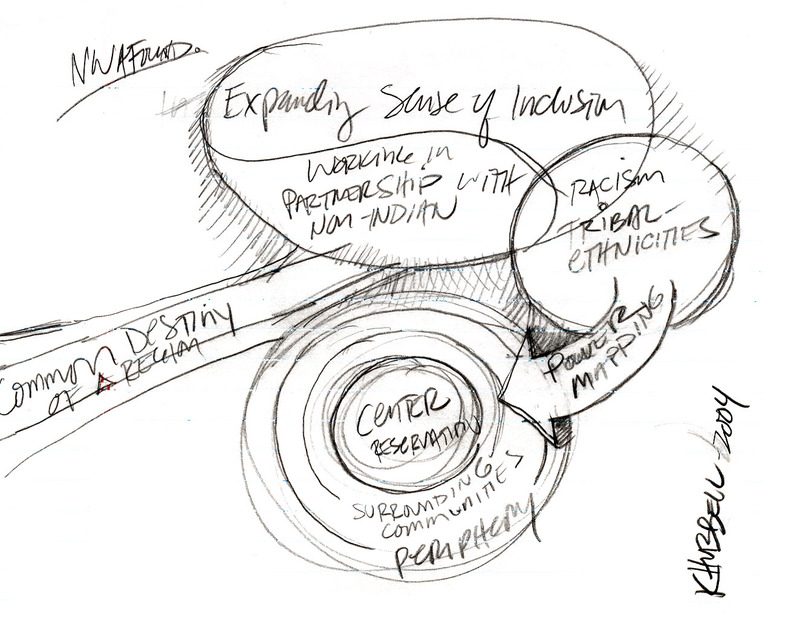 Conceptual sketch about engaging partners in a common destiny for Native community leaders at learning meeting with Northwest Area Foundation in South Dakota. 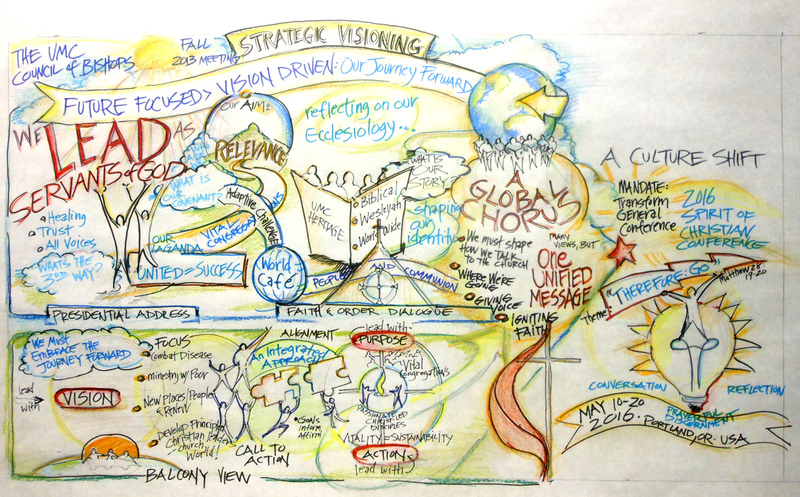 ‍Finished poster for United Methodist Conference leaders illustrating emerging options from a weeklong planning retreat for engaged faith leaders facilitated by Amy Batiste. ‍Portraits of young community college student leaders working on educational equity challenges at the 2017 DREAM conference in San Francisco. 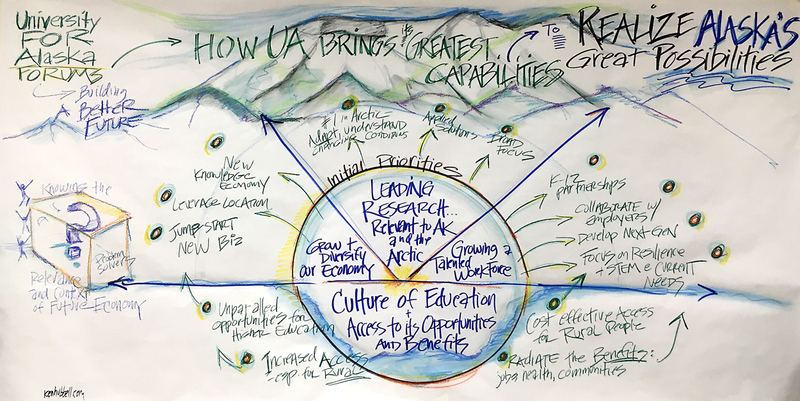 ‍Mural capturing University of Alaska’s emerging priorities to reinvigorate the state’s social and economic transformation in an era of constrained natural resources and shrinking public funds for education. ‍Visual storyboard about key leadership competencies on adaptive change for Bush Foundation leaders at learning meeting in Minneapolis. We capture the storylines and the strategic "essence" and then the key action at retreats and conferences so what truly matters is instantly visible. Ken, your willingness to share your unique gift for visual translation through long days is, in turn, a gift to all…. I am not surprised to hear that Gary and Ken did such a good job; isn't it fun to see one two brothers in action?! Seeing Ken's drawings is wonderful!